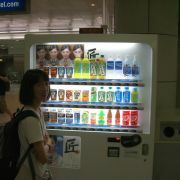 About 11 hours later, we landed at Narita, waited in a long line at immigration, and found our first vending machine. We took the Narita Express train through Tokyo ( about an hour ) and past Yokohama to the end of the line at Ofuna ( about another hour ). 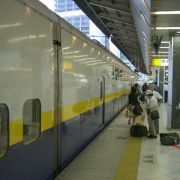 Narita is a long way north of the Tokyo megopolis, even on a fast train. 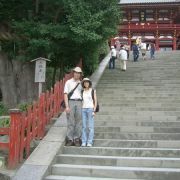 My aunt and uncle live very close to Kamakura, so my aunt took us sightseeing. 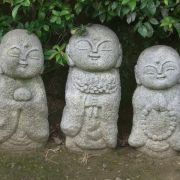 This is the Daibutsu at Kamakura. These are apparently his shoes. 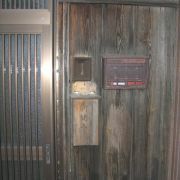 You can pay an extra 10 yen an go inside the Buddha. The stairs to the top had been closed, though. 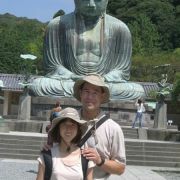 Our next stop was Hasedera temple, also in Kamakura. 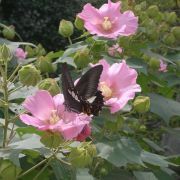 We saw several wooden buddha statues there, as well as a nice view of the bay below and some neat butterflies. 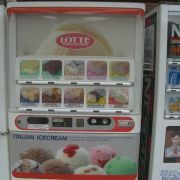 Ice cream vending machine at the train station. This one had the ice cream filled waffles. 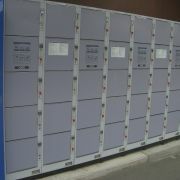 These are the sort of coin lockers that we used at the train stations to store our luggage temporarily. We had to use a larger size because even our small carry-on bags were just a little too large to fit in the standard size. 500 Yen a day will get you a nice big one. 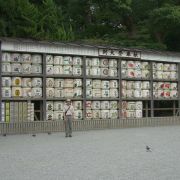 There were lots of sake kegs. and a very old Gingko tree. When gingkos get very very old, they start to grow what I can only describe as stalactites which flow down from their limbs and trunk towards the ground. 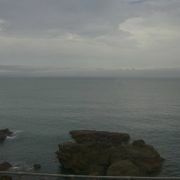 We visited some sea caves on one end of the island that have had special significance since ancient times. They had old pictures of the treacherous path that used to be used to access the caves, but luckily for us, a new bridge had been built. 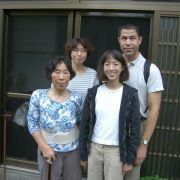 Aunt Yuuko accompanied us to the train station ( pictured here ), and from there all the way to the hotel that my cousin had reserved for us in Yokohama. 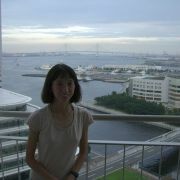 The &lt;a href=&quot;http://yokohama.panpacific.com/&quot;&gt;Pan Pacific&lt;/a&gt; hotel was in all ways excellent, and our room had a fantastic view of the Yokohama Bay Bridge. 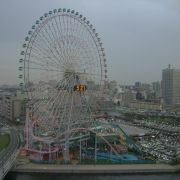 We also had a great view of one of the largest ferris wheels in the world - Cosmo Clock 21. 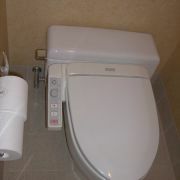 One of our many encounters with Advanced Japanese Toilet Technology. These things were in every single hotel room we had, and in every home we visited. 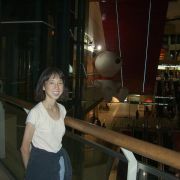 The hotel is in a cavernous mall (Minato Mirai 21) that also includes a Snoopy Store! 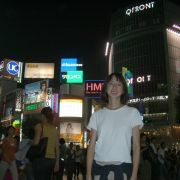 The next day we headed for Tokyo and Akihabara to see a little Japanese pop culture and technology. 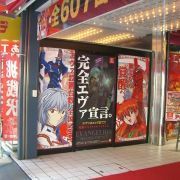 Apparently Evangelion is still pretty big. 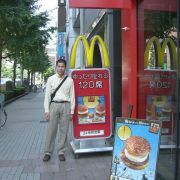 The obligatory picture of me and the Japanese MacDonalds. They have a shrimp burger here. 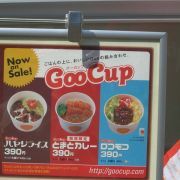 I did not try this goo cup. 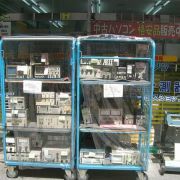 Akihabara started out as a market for electronics components, and there are still plenty of stores selling test equipment. 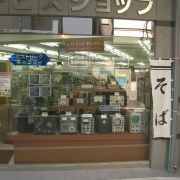 Although this store carried modern equipment, they also had a very nice display of some older pieces. 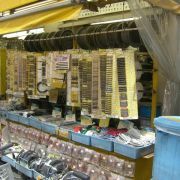 This store specializes in wire. 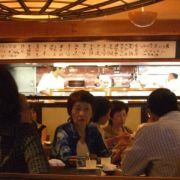 After our visit to Akihabara, we tried to find a restaurant owned by Rokusaburo Michiba - the famous Iron Chef Japanese. 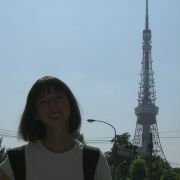 We went in the wrong direction and found the Tokyo Tower instead, after walking for about 45 minutes. Navigation is difficult in a place where most of the streets have no name, and the building addresses are assigned chronologically rather than spatially. 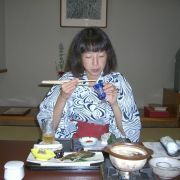 We eventually found ourselves, and got to the restaurant. 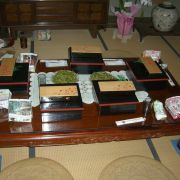 Despite what I can only describe as a situation which taxed my Japanese language skills, we got some nice food. After we had ordered, one of the managers who knew a little English stopped by and told us in detail what we were being served. 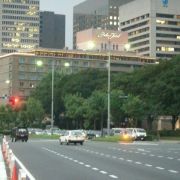 That night we checked into the Tokyo Palace hotel, directly across from the Imperial Palace. 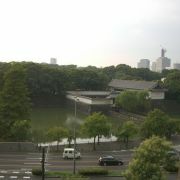 This is the view from our room. The palace hotel is a little dated, and seems to cater to the English speaking crowd. 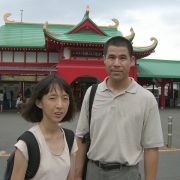 The most fluent non-native-speaker English I have heard in Japan was spoken here. 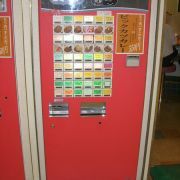 There was a curry restaurant where you buy food tickets from a vending machine and then turn in the tickets at the counter to get your food. After some shopping, we took the Yamanote line to Shibuya crossing - probably one of the busiest pedestrian intersections in the world. 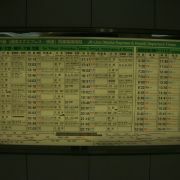 We had to get up early to catch the shinkansen ( bullet train ) to Nagaoka. 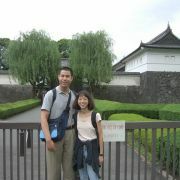 We walked by the Imperial palace on the way to Tokyo station. There are restaurants and shops in the real estate below the train tracks - it must be noisy, but I imagine the rent is cheap. 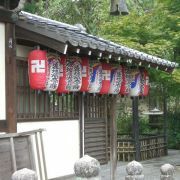 Usually these are louder places like bars and yakitori joints. 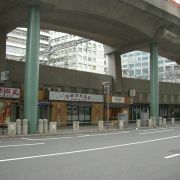 There are also taxi lots below the tracks in the Ginza district. 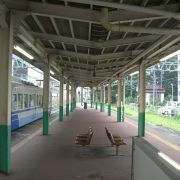 We found our train to Nagaoka without a lot of difficulty. Determining which line to stand in and which entrance to take was a bit harder, though. We had to ask a conductor where to wait because we could not read the markings on the platform. 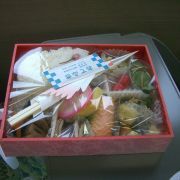 We bought a special Joetsu bento box for breakfast. Everything was pre-packaged and perfectly arranged below about 4 layers of plastic and styrofoam. 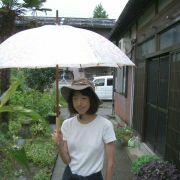 My aunt Mise picked us up at the station with her sister, and we took a taxi back to Nakajyo after another soba lunch and a little shopping. 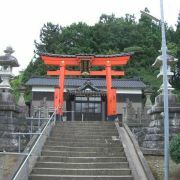 We went on a walk that afternoon and visited a Shinto shrine in Wakinomachi, across the river from the house where my mother grew up. Little did we know that we were in for rainy weather that afternoon - we left our umbrella at home. 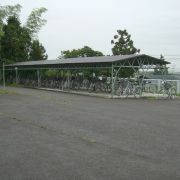 We hid below some bicycle parking structures at a local school next to a buddhist temple and waited for the deluge to pass. Aunt Mise ordered out for a very fancy meal from a local restaurant. 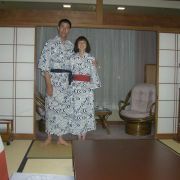 Linda and I wore yukata ( a kind of light and simple summer kimono ) which aunt Yuuko had given us in Yokohama. 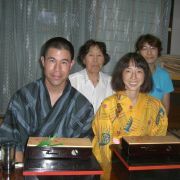 In the back are my aunt Mise and cousin Marie. 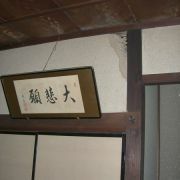 The old farmhouse still has a lot of damage from the earthquake last year. One wing remains uninhabitable. The next morning it was still raining lightly, but we took a short walk around the property. 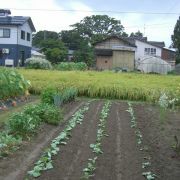 They grow taro, radish, cabbage, tomatoes, cucumbers, and soy beans, as well as fields of beautiful rice. 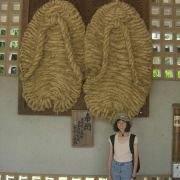 The rice fields in Japan go right up to the roads and walkways. We were there in the middle of harvest time, so some fields had already been cut. 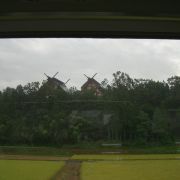 We even saw harvesting machines working in the fields while it was not raining. 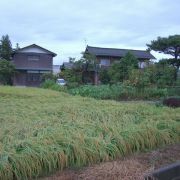 The rice plants were heavy with seed. 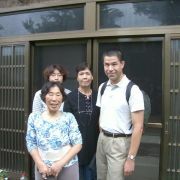 We said goodby to Mise and her family that morning, and hopped in a cab back to Nagaoka station. 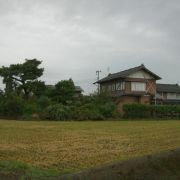 In contrast to the controlled chaos of Tokyo station, Nagaoka is more rural and can be quiet at times. Big crowds still follow each train, but it calms down a lot between the arrivals. 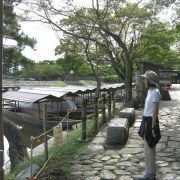 On the recommendation of my cousin, we took the express train to Kanazawa and then to Kyoto rather than taking the bullet train again. 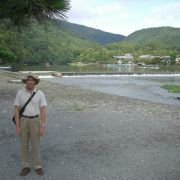 It was a good recommendation, as we were able to see many strange and unidentifiable sights. We spent a good part of the journey along the sea of Japan - much more interesting that being in a dark tunnel in the bullet train. 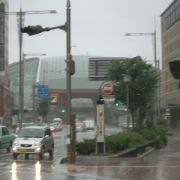 Unfortunately, our visit was plagued by rain. At least we brought our umbrella this time. 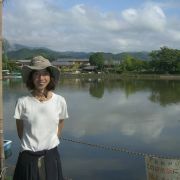 After getting semi-lost again, we stopped by the local fish market, bought a couple of croquettes, and were on our way. 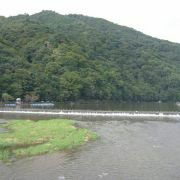 Arashiyama, just outside Kyoto. 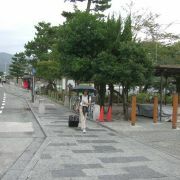 We walked from the train station to our ryokan - a traditional Japanese hotel called Togetsutei. 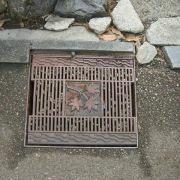 It was labeled only in Japanese, and a similar level of non-english was to be found inside. 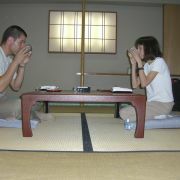 Here they serve you tea, dinner and breakfast in your room. 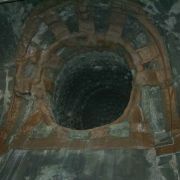 They also have large communal baths. 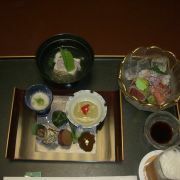 The dinner was kaiseki style, and probably was the bulk of the cost of the room. 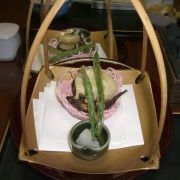 Everything was elaborately presented and delicious. 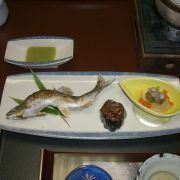 We ate whole ayu, a kind of river fish. 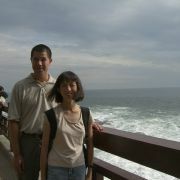 They did not speak much English at all here, but we were able to get by just fine. Maybe my Japanese was improving? 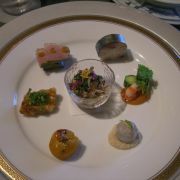 Presentation seems to be everything. 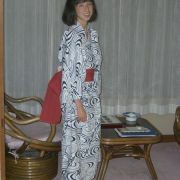 They Ryokan provides two sets of Yukata, for the full effect. 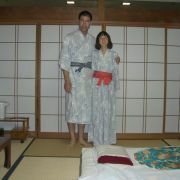 These robes are worn around the hotel and baths. Set #1 got changed to 3x-large size for me when the attendant saw how a large size fit. Set #2 never got the new size. 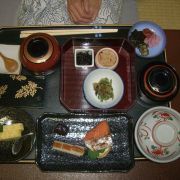 Our breakfast was not as elaborate as the dinner, but it was still made of many little dishes and included a tofu hot pot. We left our luggage at the hotel and walked around exploring the area. 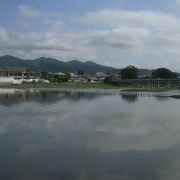 They have cormorant fishing in the evenings here, weather permitting. 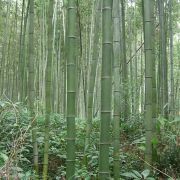 We walked through a famous bamboo forest. 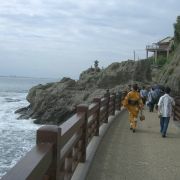 And up to the top of the hill, to Nembutsudera. 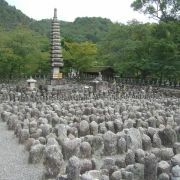 There are thousands of little stone buddhas here, which we later found out we were not supposed to photograph. Oops.